Chris Edwards can trace his family's roots back several generations, but he grew up not caring about what happened last week. "Local history meant nothing to me," said Edwards, 50, who along with his wife, Elaine Weeks, has just published a lavish new edition of his Windsor history book, Best of The Times. "I had to move away then move back to appreciate what this city had to offer," he said. 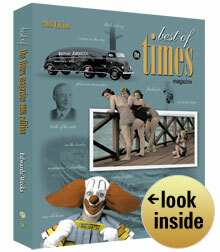 Best of The Times, 2006 edition, is an enlarged and updated version of the 2004 coffee-table book published by their company, Walkerville Publishing. All 3,000 copies of the first edition sold out within a year. It took Edwards and Weeks a year to put the first one together from articles in their magazines, Walkerville Times and later The Times. The new edition was another six months in the making. "We take our history for granted," said Weeks, 50, daughter of former mayor, the late Bert Weeks. "Chris and I moved away for eight years. But after we returned, we had a completely different perspective on the city." Weeks grew up in Walkerville, while Edwards was from "the other side of the tracks," according to Weeks, on Marentette Avenue. Every day, they passed many of the landmarks that are now in the book without once thinking about their significance. "Now I look around us and can only imagine what these neighbourhoods looked like," Weeks said, glancing out the window of their company's offices in the former Walkerville post office on Devonshire Road. Like so many from the city, the two pursued careers outside Windsor. Returning in 1998 with backgrounds in advertising and marketing, they set up shop in old Walkerville and their renaissance began. A year later, they launched Walkerville Times, a monthly publication on local history and personalities. Later, they dropped Walkerville from the name as their focus broadened to include the whole of Windsor and Essex County. Edwards grew up in Windsor the son of Jack Edwards, a city booster and onetime campaign adviser to Bert Weeks. His mother's family, the Marentettes, trace their roots back several generations and were among the founders of Stoney Point. Weeks moved here in 1946 from Montreal, opening a jewelry and watch repair business on Ouellette Avenue. He quickly became active in local politics and became mayor in 1975. The first Best of The Times included nearly 1,000 photos and articles drawn from the pages of The Times. Opening with Weeks' elaborate biography of Walkerville's namesake, Hiram Walker, the book turned out to be a surprising success. "We didn't anticipate how big it would be," Edwards said. "People were buying it for their parents, or for their kids to show them what Windsor was like." The original came out in 500 limited-edition hardcovers and 2,500 softcovers, but to meet demands, the new edition is all in hardcover, another 3,000. "We took a little bit of a chance and priced it higher," Edwards said. "But we wanted something people could treasure for years." The edition is eight pages longer than 2004, with 12 new articles, more photos, letters and updates. For 2006, Weeks contributed a Legacy Profile of her late father. There's also a reprint of a newspaper article about Bert Weeks' efforts to clean up police corruption in the 1950s. A tribute to the late, great drive-in movie theatres of the area. The effort to save the former Lancaster bomber memorial at Jackson Park. The "lost" bathing beaches of Windsor. Ronald George Sears, Windsor's infamous "Slasher" of the 1940s. Profiles of three of Essex County's historic homes -- Kingsville's Davis H. McCay House, and two in Windsor: the John Wesley McConnell House at 509 Crawford Ave.; and Foxley, the Albert Kahn-designed home at 811 Devonshire Rd. Two devastating fires in Windsor, in 1867 and 1871, which required the help of Detroit firefighters to quell. The mystery over the location of graves of blacks who fled to the area along the Underground Railroad. A coming-of-age reminiscence by Sonny Batstone about high school swim teams and skinny-dipping. A history of local schools, such as Walkerville Collegiate, Lowe Secondary and Edith Cavell elementary school. Stories of two race riots in Detroit in 1943 and 1967. Writer Al Roach's reminiscence of a Windsor Christmas in 1942. The endlessly fascinating stories of Windsor during Prohibition, including large sections of Marty Gervais' book, The Rumrunners. The first explosion in the town of Essex in 1907. "We wanted to create a history of Windsor and Essex County that was fun and approachable," said Weeks. Twenty-five copies have been purchased by the Greater Essex County District School Board for school libraries. "My father didn't come from Windsor," Weeks said, "but he loved this city. What I'm doing is an extension, I believe, of what he did but in a different way." The 2004 edition created a sensation, prompting readers to scour their attics and storage trunks for memorabilia and family artifacts. Some of it turned up in the new edition, but lots more wound up in files at Walkerville Publishing. "I like to call it Windsor's one degree of separation," Edwards said. "Everybody seems connected to everybody else in this town." Is another edition of Best of The Times likely? Edwards thinks not. "This took us a lot of time, six months, to put together, and we do have a business to run. I don't think there'll be a third edition." Weeks turned toward him and said, "Maybe."